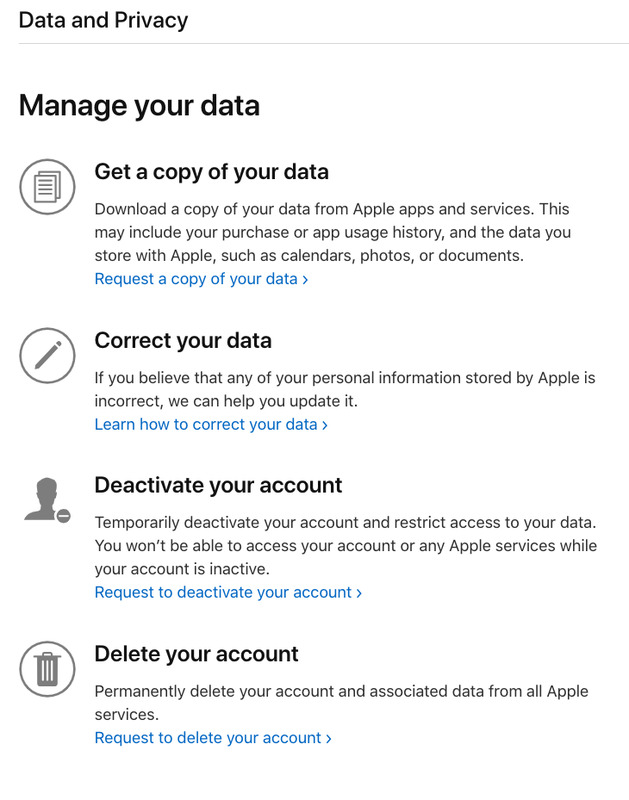 Turns out, it’s easy to access Apple’s new user data portal. Start at privacy.apple.com. Then, you’ll be asked for your Apple ID and password. Once you’re in, you have a few options, including downloading your data, correcting your data, and deactivating or deleting your account. Apple will tell you all the different kinds of data that it has on you, along with the formats they come in. It will ask what’s the largest file size you can handle. But you can’t download your user data right then. Apple has to prepare the download, which takes a few days. I requested my data on a Friday, and got an email that it was ready the next Tuesday. Here are all the general categories of data that Apple keeps about me. I can download them individually or all at once. For example, I probably don’t need to download what I have on iCloud drive, because that stuff is already on my hard drive. There was also information about every time I’ve had a repair at an Apple Store, reported a problem to Apple Maps, and, oddly, every time I received and opened a marketing email from Apple. The readiness checklists have been updated and you can find them in the “How do I” menu under “Get Ready”.